Love sushi? 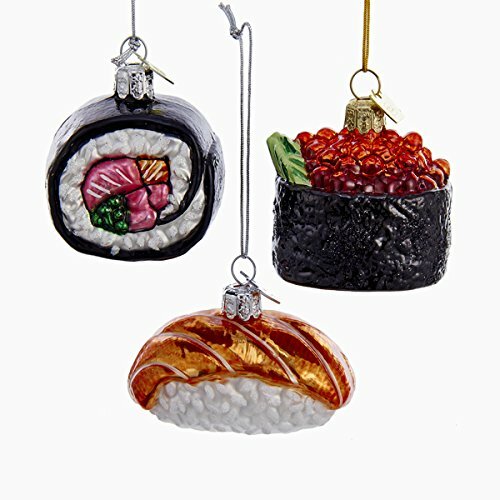 Then add some sushi-themed ornaments to your Christmas tree this year. These ornaments are unique and fun, and will definitely add some personality to your Xmas tree. 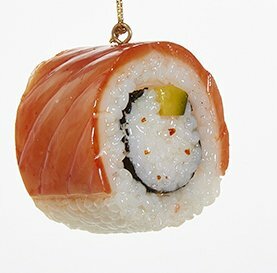 Sushi for your Christmas tree? Why not! It's fun to collect ornaments related to your favorite hobbies and interests and add a little personal touch to your Christmas decorating. 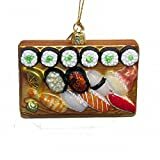 They're also a fun gift idea to surprise someone who loves sushi and all kinds of Japanese food. Here you'll find a collection of different themed ornaments, from beautiful blown glass creations to fun themed assortments with lots of intricate detail. You'll also see ideas on how to make Christmas-themed sushi - perfect as a holiday party treat! I'll also share some beautiful photos of sushi so you can see just how like the "real thing" some of these ornaments appear! 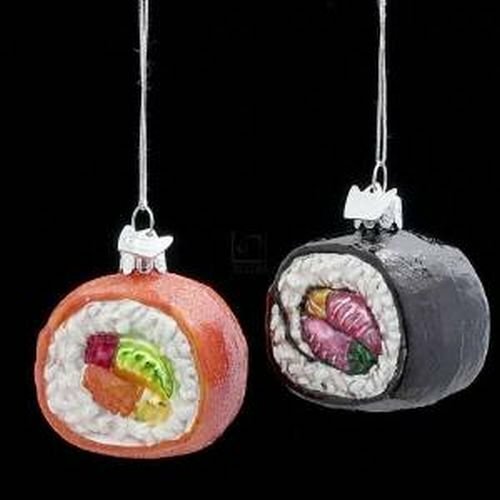 Fun tree decorations - shaped like sushi rolls (maki sushi)! These traditionally-made blown glass ornaments are pretty - and delightful! 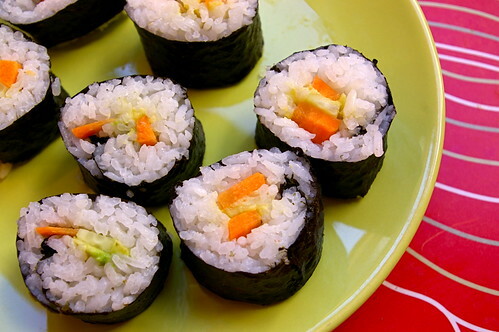 Each one looks like a different type of sushi maki roll. Get a set of them all for a fun set for your tree, or to make a great gift set. 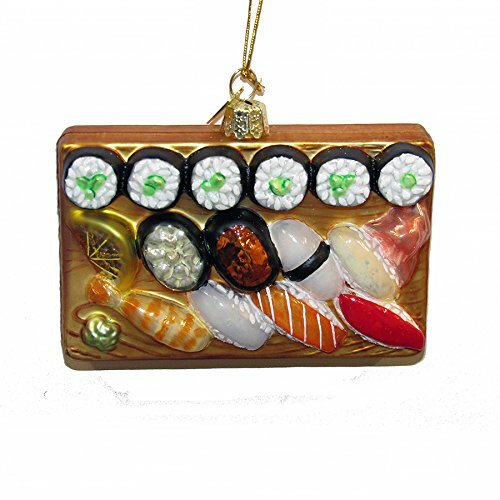 Why not start with an entire sushi platter on a Christmas ornament! 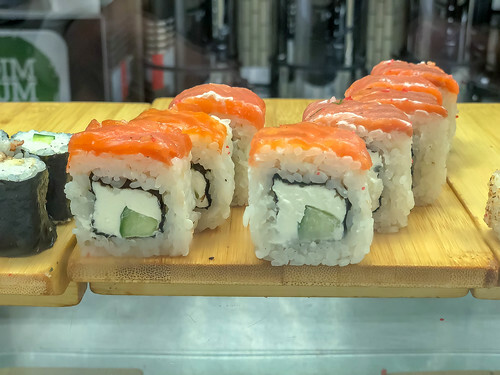 This delightful piece is perfect for any sushi lover you know, as it's easy to identify each piece of nigiri sushi on the plate (shrimp, tuna, salmon, roe, etc.) as well as six pieces of maki sushi. There's also of course some wasabi and pickled ginger! A fun and beautifully-crafted mouth blown glass ornament. 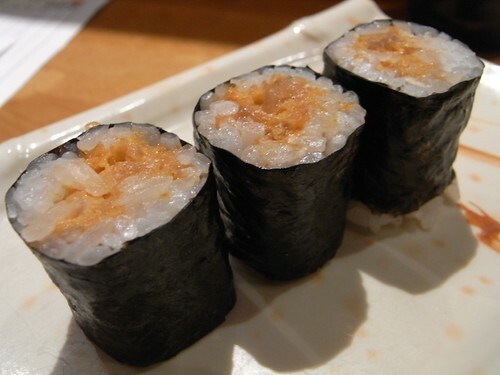 It looks just like a traditional sushi maki roll slice, perhaps a spicy tuna maki as pictured below. It's over 2" in size, hand painted and decorated with glitter to really sparkle and shine. 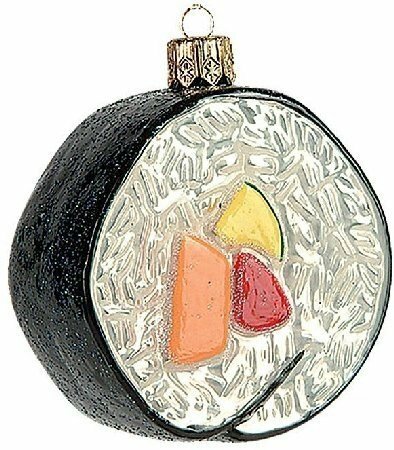 Doesn't this ornament look just like the "real" maki sushi pictured below? It's mouth-blown and hand-painted in Poland, and also comes with a gift box so it makes a great present for a sushi lover. Here's a pair of sushi maki roll ornaments in contrasting colors. One looks like a traditional tuna maki roll, the other a fancy roll perhaps made with pink-colored soy wrapper. Cute and colorful, this would make a great set of two for a sushi lover. This ornament looks just like a piece of "inside-out" roll topped with a slice of salmon, don't you think? Compared to the picture of the "real thing" below...it's almost enough to make me hungry right now! Serve these adorable sushi "Christmas trees" at your holiday party this year...they'll be a great treat to tie into your Japanese food decoration theme! How about a hand roll? 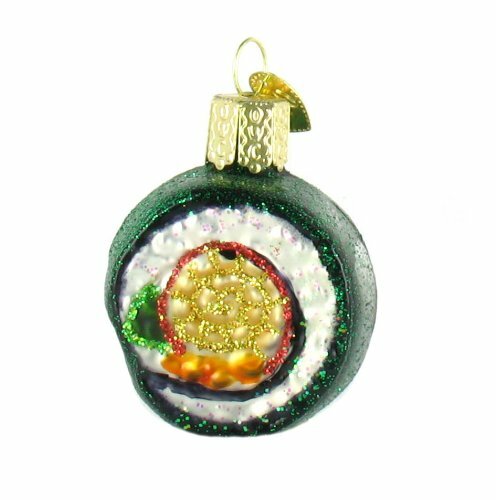 Temaki sushi is another variety which of course deserves a place in your sushi-themed Christmas decorations! This is another mouth blown glass ornament from Inge-Glas in Germany, very artistically made and sure to look great on your tree. 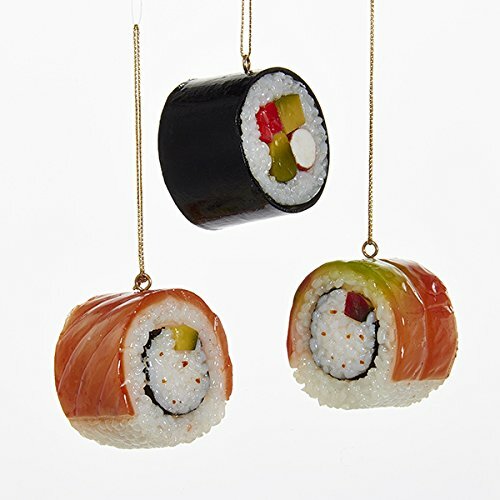 These sushi ornament collections make for Christmas tree fun! These two sets from Kurt Adler are perfect for people who are just crazy about sushi! Each set of three features different fun and colorful designs. The first is made of glass, so they're extra shiny and colorful. The second set is made of plastic - perhaps better if you're worried about children (or pets) getting at your Christmas tree. Christmas-Themed Sushi Treats You Can Eat! I love it all, give me a variety! Then check out some of my other articles about one of my favorite foods! 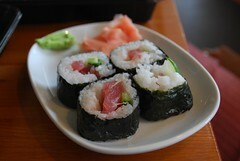 Sushi normally is traditionally with raw fish, vegetables and vinegar rice. But you can make fun "dessert sushi" with all kinds of ingredients! 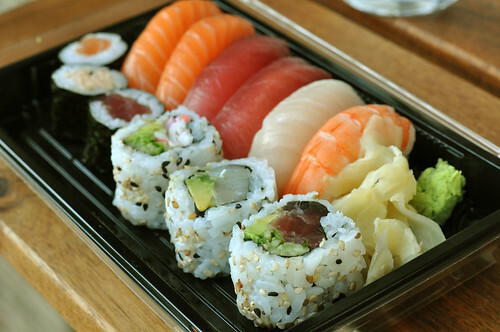 Do you love sushi? 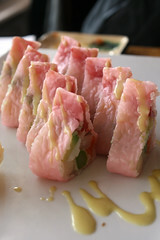 This page is for all lovers of sushi who want to learn more about its history and styles of preparation. Sushi is pretty, so having ornaments made to resemble this food is perfect! Yes, a mobile would be a great idea! I like to eat sushi and the ornaments are cute. You could also use them to create a mobile and hang it in your house and not have to wait until Christmas.